• Free granting of web site completely filled with information on offered goods, with possibility to add accompanying goods in the e-shop. The web site is made in English with possibility of addition of a second language. We give access to the administrative panel of the site and within several days we help to translate the site into your language. By the end of the first week you receive a complete site for clients from all countries. Possibility of creation of corporate mail, special protection of servers of corporate mail against hackers. • Free granting of Internet shop. The shop is completely filled by photos of our products, product range, descriptions of the goods. All you need to do, is to translate product names into your chosen language, to change currency and price, to add contacts and to enter repayment terms and deliveries – and you end up with a complete Internet shop and it is absolutely free for use. • Entering inquiries from retail and wholesale clients in the region attached to you. Inquiries from every corner of the globe both from retail, and from wholesale clients regularly appear. We send you all inquiries from clients from your country and if you have exclusive rights on representation of INKSYSTEM products, you must also resolve all inquiries from wholesale clients. • Constant possibility to consult with the central office in your part of the world, both on commercial and organizational, and on technical questions. At any moment you can ask a question to the contract manager or the technical support manager who will quickly and skillfully help you to solve the arisen problem. • Assistance in site and Internet shop promotion. Our experts will teach you free of charge how to reach the top by key inquires in Google search system in your country. Also we incur 50 % of expenses on promotion in the first two months of your job. • Free advertising support in English: business cards, booklets, banners, posters, packages, flags, labels … high quality advertising material free of charge. We provide all product models for translation into your language. • Possibility to use the "INKSYSTEM" international brand-right to use brand name and all INKSYSTEM products. • A list of instructions on installation and technical support of CISS for different models in written form and video demonstration. 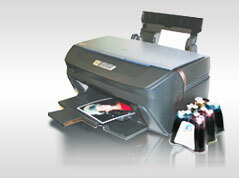 • Videos on installation of CISS on the most popular printer models. • Constant on-line support by our experts. Cell phone, e-mail, ICQ, Skype-you can always communicate and be assured that you will get assistance. Your clients are our clients, therefore we will do everything possible to make everyone happy. • Low initial investments. Depending on the Concept, initial investments start from 3,000 USD. Training passes remotely by means of video-conference (through Skype), duration of training course– 1 workday. Business with a developing company should be advantageous. An average due date of recoupment of the project – from 3 months. We create for you all conditions for excellent start, we grant the complete, calculated business model which has been proven in practice, the rest entirely depends on your working capacity and desire to successfully to develop together with us. For 100 % reliance on our words, we are ready to provide you with contacts of companies who cooperate with us in other countries. Our experts will teach you to provide technical support not only for INKSYSTEM products, but also for Epson, Canon, HP and Brother printers, knowledge which will bring you additional revenue from office equipment repair. It is also possible to introduce production of discount cards and souvenirs. We will help to introduce these products for increase in profitability of your enterprise.